Back in June, Taiwan Semiconductor Manufacturing Company (TSMC) struck a three-year deal with Apple to produce A-series chips for iOS devices beginning in 2014. The move was seen as part of Apple's strategy of moving away from rival Samsung for component supplies, although Samsung was soon after reported to have landed its own deal to once again produce chips beginning with the A9 in 2015. According to Korean news outlet Hankyung [Google Translate] (via The Verge), Samsung will also remain involved in next year's A8 chip family, with TSMC handling 60 to 70 percent of the manufacturing load and Samsung picking up the remainder. Today's rumor about the A8 chip still makes it unclear as to whether TSMC and Samsung will both produce A9 chips for Apple in 2015, but it seems that Apple is working hard to diversify its supplier relationships and will be drawing on both TSMC and Samsung for the foreseeable future as the two companies compete to push their technology forward. A look into the A7 processor last week revealed that Samsung was indeed the manufacturer for the chip, with the chip produced at a smaller 28-nm node compared to the 32-nm A6. 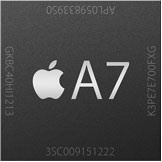 Currently, the A7 chip is used in the iPhone 5s, and an updated "A7X" version of the chip is almost certainly set to arrive in Apple’s next-generation iPad and perhaps an upcoming iPad mini with Retina display. Actually it is. It points out the hypocrisy of some. Clearly I meant it in jest. But maybe some people will realize how silly it is for them to be so spiteful when in fact they benefit from their existence. I hope this doesn't turn out like the MBP retina display business where non-Samsung panels had yellow spot issue. and why shouldnt they..i mean they are doing a good job and business is business..
Apple really needs their own fabs. Come on Apple, they're only like $5 billion. Multiple suppliers. Less dependency. More competition. Smart Apple. Boom! Begin the iPhone 6 rumors. Yep. That's what they're doing. Are you implying Samsung can come up with their own ideas? That would be a new. Samsung's business model is to copy other companies ideas, because Samsung is bad at design and do not know how to innovate. No need for Apple to give them any more intellectual property. Of course Samsung is happy to assist with production of the A8! They've probably offered Apple a very attractive price to do so. Making chips for your competitor is, after all, a good way to keep a close eye on their product plans. Samsung uses high ram and many cores. Apple, dual cores, now 32 bit. Samsung will more than likely move to 64 bit in the next year, and has been planning to for some time.